Nyl’s 1976 sole release is curiously still very much under the radar despite it being one of the most intriguing French psychedelic/prog albums from the 70’s. The music is highly creative and energetic with a definite space-rock feel in the style of Hawkwind, but also reminiscent of Amon Düül II and Agitation Free. Michel Peteau’s guitar is the driving force around which all other elements create a whirlwind of sonic psychedelic infusion veering between loud psychedelia and irreverent pulsating rock groove “a la” Gong. Features Ariel Kalma (flute and sax), as well as Janick Top (From Magma) and Bernard Lavialle (from Ame Son). Originally released on Richard Pinhas Urus Records. Golden Pavilion Records reissued the album in high quality heavy paste-on gatefold cover, limited to 500 copies in black vinyl and 100 in coloured vinyl. What is the story behind Nyl formation? Nyl was born in 1974, from the ashes of Cheval Fou when my brother Jean left the project; Stéphane Rossini and I started from zero at this point (but with all the experience and energy of our Cheval Fou halted in full gallop). 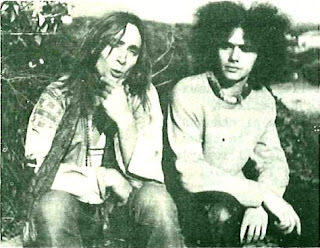 Armed with our demos, we went searching for producers who would record an album for us, but at the time, record companies were blantly aversive to our music, still very much connected to the psychedelism of the 70’s whereas punk was clearly gaining ground and establishing itself at the main front. One of my friends, Alain Dister, advised me to pay a visit to a certain Richard Pinhas, who had just created his label, Urus Records. He also had formed Heldon, a surprising group which lay the foundations of an experimental electronic music. It seemed that we were on the same wavelength. Richard didn’t hesitate on the matter of producing our first album. Stéphane and I entered the studio together with Patrick Fontaine and Bernard Lavialle (from Ame Son), Free Quentin (from Agon), Olivier Pamela (singer of Schizo), Patrick Gauthier (from Heldon), Loy (Crium Delirium) but also Didier Batard, Jannick Top and Elisabeth Wiener – who happened to live right above the studio. My first concert was at Rue des Viarmes in Les Halles in Paris. I told myself that this was happening a little too early in my life … I had just met Stéphane Rossini, we were both 16 years old at the time. I only knew that he was, just like me, a huge Who fan …. He had just acquired a drum kit, with double bass drum, same as Keith Moon’s … All the while, as luck would have it, the guitarist of Crouille Hammer, a French group made of film actors (such as Jean Pierre Kalfon, Pierre Clémenti, Vina Aumont and Valérie Lagrange), suggested we’d make use of their equipment while they were away on a journey through India. A great sound system, Gibson SG, Marshall Island AC30 … It was incredible! Nothing else stood in the way of us becoming a group. Except that we did not know how to play, and none of us had any real knowledge of music … But our desire was so strong that we manage to surpass this problem, by trying every day, very hard and quite insanely in fact! The room was full, Stéphane, Jean and I felt “out of this world”, the crushing stage fright paralyzed us totally, we became aware of the significant gap that existed between our teenagers dreams and the actual reality of the stage. 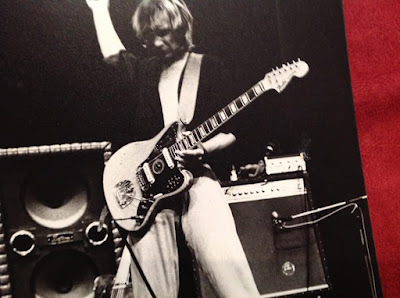 I remember coming to the stage, adjusting the settings on my amplifier, and playing the entire concert with my back to the audience! We played for about forty minutes, very much in free form, and then we received a wave of enthusiastic applause! Cheval Fou was born! Shortly before our first appearance in 1969, I acquired my very first guitar, an acoustic Yamaha. I had taken some lessons in Paris with Roger Mason, master of the picking … All the while I secretly dreamed of mastering Pete Townsend’s reels! I quickly dropped my lessons as well as all acoustic playing, and started practicing hard on a Gibson SG with a Marshall Island amplifier… But what I consider to be my real 1st guitar (which I still own) is a Jaguar, which I used to play on a massive custom amplifier- to get “leveled” with Stéphane Rossini, who played very very loud! What were your first musical involvements? In Paris, I grew-up in a rich cultural environment; my father wrote for “Jazz Magazine” … my 1st musical shock, from what I can recall, was to hear “Just A Gigolo” on vinyl or on a radio at home. At home, all kinds of musicians came by and played music. And then when I was around 15 years old, sometime between getting my 1st guitar and experiencing The Who live in concert, I told myself that my turn would soon come. Through my father’s occupation, the 3 of us were part of a sort of “freak tribe” that was formed around the newspaper “Le Pop”. 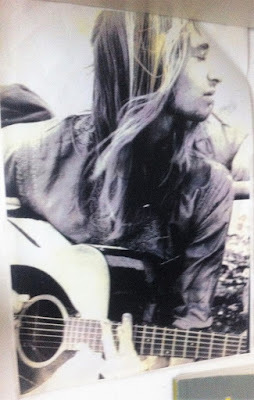 This was a community of people with alternative ideas, politically on the left, and generally very marginal to the whole fast growing consumer society; Stéphane, Jean and I were able to create our musical universe in a strongly inspiring and motivational environment, that existed outside the everyday world. All usual duties and routines of adult life were absent in our new reality. In the tribe, our sole function was to play music. But this was also a responsibility, because we HAD to play music everyday (and thus create it). The community counted on us to live! A unique experience. While the group took care of the music, the tribe took care of the rest, and mainly to publish the newspaper which was inspired by the American free press. 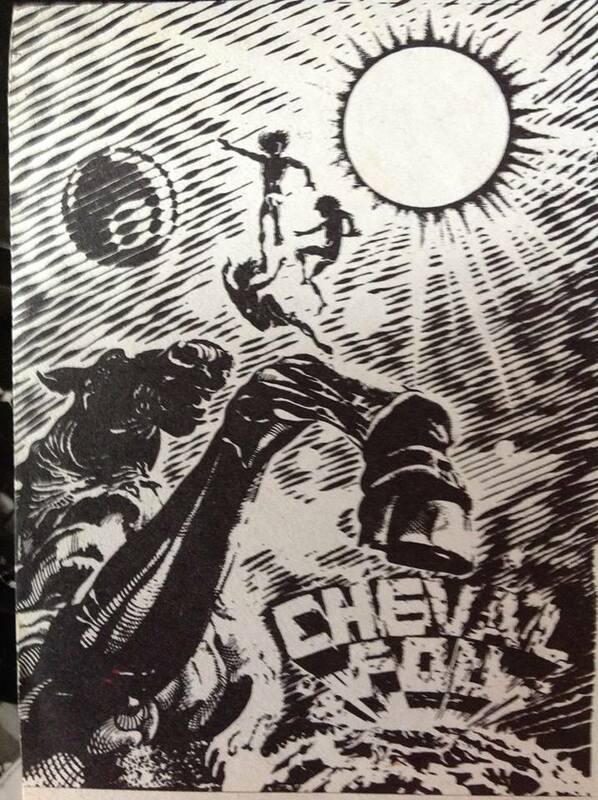 Cheval Fou recordings were released in 1994. The material was originally recorded in early 1970s. At the time when Cheval Fou was active, record companies were interested in things like Martin Circus … one did not even think of getting a contract. We lived in such a disconnected way from everything (not to mention the drugs that circulated in the Tribe). We traveled, we forgot Paris from where we had escaped, we lived music as something completely immaterial. Twenty years later, at the beginning of the 90s, Patrick Mennyer, director of Legend Music, contacted me about Cheval Fou and suggested to put it all into an album. I explained that I didn’t have these recordings anymore, that everything had been lost in our journeys. He did not feel discouraged and made it a point of unearthing the masters which had to be somewhere … A short time later, he appeared with a suitcase containing quite good quality magnetic tapes of Cheval Fou – excited as any good producer can become, he suggested us to work at the mastering studio, as long as we needed until we have a finished album. This is how the Cheval Fou album came to light! Did you do any concerts as Cheval Fou or Nyl? We made a great deal of concerts of Cheval Fou within the “Pop Tribe”. When my brother left the group and the Tribe, we created Nyl with Stéphane, but we did not have time to play live consistently. I remember that we played the “Fête de l’Humanité” in September 1978, in front of tens of thousand of spectators … It’s a dear memory to me. With us were Elisabeth Wienner, Jacques Lennoz, Free Quentin … And then the fact that we were connected to a whole movement of bands such as Urban Sax (the follow-up to Lard Free’s Gilbert Artman) … One memory that stands out, is to experience one of the first Stinky Toys concert (Elli Medeiros and Jacno), a rising French new wave punk group. When I heard Elli Medeiros savagely roaring to her microphone, over 3 chords riffs, I felt that something quite powerful had come, a “new wave” that would very soon wipe everything else under the carpet … The wind had changed, it was imperative to move in a new direction, in order to avoid being swept away by this tidal wave. This was the end of Nyl. Ten years later, I could rejoice by having become Elli Medeiros’s guitarist! What does the name “Nyl” refer to in the context of the artistic name? Nyl is a reference to ancient Egypt. Stéphane Rossi found the name. He was fascinated with ancient Egypt culture, and all the inherent aesthetics that came along. He used to say that Nyl was “like a energy stream which settled on the audience to fertilize it, before withdrawing slowly”. What was the songwriting process like ? The times were very lysergic … We drew our inspiration from deep inside our brains when “under the influence”. From there on, long improvisations were born, we spent hours playing without ever noting anything … we did not speak of musical notes, nor in tonality, we spoke of colors! “That piece in turquoise, that piece in rusty shades … etc”. And of course, we never did the same thing twice. Every piece was like a saga which we lived very intensely, very profoundly; in “Hannibal” for example, we truly experienced the passage of the Alps with the elephants, and when the piece ended, we needed some time to recover from this journey … On stage, some songs could last half an hour, according to how we felt and the general atmosphere of the venue. How did you get in touch with Urus Records (formed by Richard Pinhas of Heldon)? Various of guest musicians appeared in the studio. The most distinct was definitely Jannick Top of Magma. The connection with Jannick Top was due to Stéphane. Both were totally hooked on Egyptology. It was just around the time when Patrick Fontaine was about to leave us, Jannick came to the studio to listen to us, he sat down, took some notes and asked us – “Are you OK with the structure? It is always the same?“ “Hm, yes and no …”. At this point, we did not even know the name of the notes, we had learned to play together by developing systems familiar to us, such as the colours, the energies … etc. Jannick plugged his bass to the Ampeg, started counting “1-2-3-4” and bang! We were on! This moment will remain engraved in my mind all my life! We lift off and were carried, lifted, and at the same time held down from the cliff to produce solos over and over again … The album Nyl was recorded in one single day, then mixed by Dominique Blanc-Francart at the Aquarium Studio, also in 24 hours. Can you share some further details how your Nyl album was recorded and released? This was our first professional studio experience. Our goal was to keep all the spontaneity of a live recording, without being infected by a sound engineer’s masking tricks. Of course there was no chance for this to happen since the album was done in 24 hours. The sound engineer would run in all directions to catch instruments while we were teeming with ideas; I still thank all these friends who passed by and contributed superbly, without veering away from the vibe, in particular Olivier Pamela with vocals and bass on “Abery”, Bernard Lavialle who played guitars and Patrick Fontaine who played bass (these both came from Ame Son), Loy Erlich and Patrick Gauthier who played the piano, Ariel Kalma and Patrick Quentin who played soprano and alto Sax … and obviously Jannick Top, who was the glue between all these talented musicians. During the mixing, Dominique Blanc-Francard used a Revox to create delays never heard before, and he also created an insane mini Moog solo that was the icing on the cake! Bertrand Dhomme for the front cover. Pierre Lacombe for the back. We met Bertrand who used to go back and forth between Formentera and Paris. 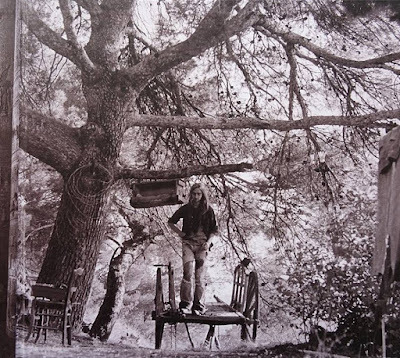 He often passed by our house – rehearsing studio in Esbly – in the suburbs of Paris. 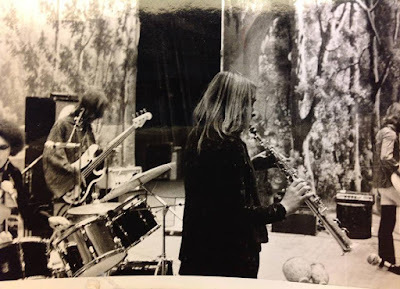 Many friends came to see us and settled for an undetermined amount of time: Jacques Higelin, Pierre Clémenti, Kalfon, Philippe Garrel, Ariel Kalma … Their presence motivated us to play and we spent several nights improvising. 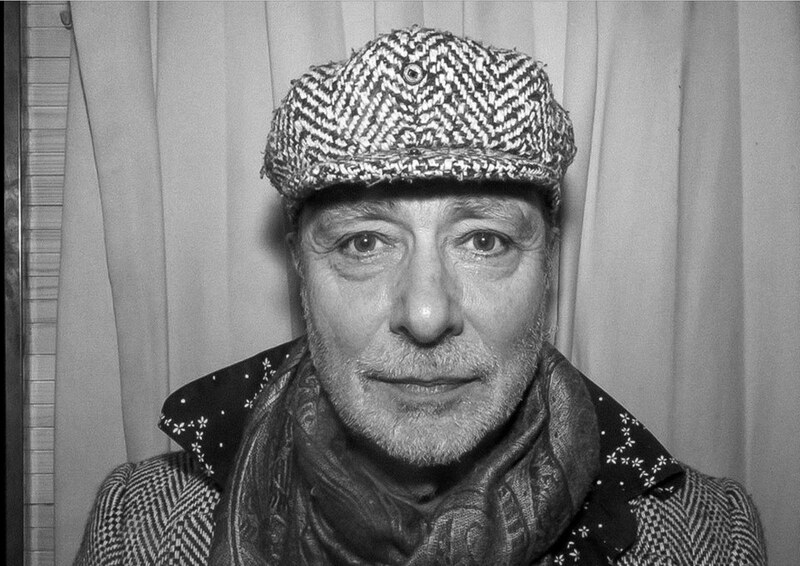 Bertrand is a transrealism painter; he collaborated in several movies and experimental shows, in particular “Garrel / living theater”. He offered us this painting for Nyl, which he painted one day while listening to our jams. I have no clear recollection in what regards Pierre Lacombe, doubtless a short-lived meeting, possibly derived by this present.. Yes of course. 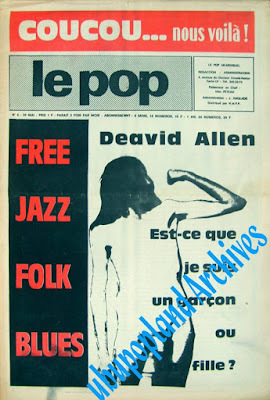 After my cultural shock at the “Fête de l’Humanité” in 1978, when I discovered the beginnings of punk and all that raw energy around it, I quickly disposed of my hippy garments, including drugs and all the rest. Stéphane on the other hand got deeper into the world of Egyptology. I met Lola Jeannel, who was going to become my wife and my partner in La fiancée du Pirate. For almost 10 years, I worked on this pop project, signed to Sony. We released two albums under this name, and I began working with a whole new musical family: Pop French new wave of the 1980s. I set up my own studio and started producing various projects. Today, I’m working on a project which is very dear to me: “SuperBravo”, an incredible French pop trio, in which I play guitar and produce. I’m accompanied by two wonderful talented girls: Armelle Pioline and Julie Gasnier. Our last album L’ Angle vivant was released on Zamora label a year ago. Would you discuss some of your most memorable moments in Nyl and what made them so? Golden Pavilion Records recently reissued Nyl on vinyl and will follow-up with the reissue of Cheval Fou. Antonio Barreiros contacted me on Facebook, and we collaborated during one year to enable the re-release of Nyl. People like Antonio do the wonderful work that publishers should do, that is to bring forth, with dedication, projects worthy of our interest. But this work looks more like a craftsmen’s work rather than just business, so much so that only real passionate people are capable of this needed devotion. It’s imperative to encourage the revival of record dealers, vinyl and music outside of the internet realm! Special thanks to Antonio Barreiros of Golden Pavilion Records for the most wonderful reissues and for the translation of this interview with Michel Peteau. Thanks for sharing this, it's nice to discover artists outside of the Anglo-American sphere. Nice interview, Peteau's an interesting and articulate man. It's Psychedelic Baby continues to do a good job of introducing readers to more interesting music, particularly the obscure ones. 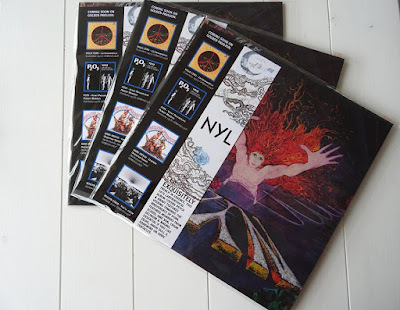 re-issue of Nyl, can you help me, please.